A covalent chemical bond that links two carbon atoms through a phosphate group, especially the bonds that link the pentose sugars of adjacent nucleotides in polynucleotide chains of RNA and DNA. The chemical linkages that join up the sugar, base and phosphate NUCLEOTIDES of DNA and RNA into polynucleotide strands. The subunits of the strand are triphosphate nucleosides, but when a number of these join up (polymerize) under the action of the enzyme DNA polymerase, two of the phosphates are cleaved off leaving only one phosphorous atom between each pair of adjacent sugar molecules. 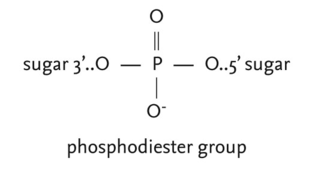 The two ester (diester) bonds in each linkage are Carbon-Oxygen-Phosphorus from the 5’-carbon on one sugar and Carbon-Oxygen-Phosphorus from the 3’-carbon on the next. The hydroxyl (-OH) on the 3’-carbon is also lost. A nick is a lack of a phosphodiester bond between consecutive nucleotides. Subsequent digestion with uracil N-glycosylase, which releases uracil from both single-stranded and double-stranded DNA and thus creates apyrimidinic sites, and endonuclease IV, which cleaves the phosphodiester bond at these sites, generates a defined series of fragments (7, 8). In addition to catalyzing phosphodiester bond formation, montmorillonite also influences the regiochemistry of the phosphodiester link produced.